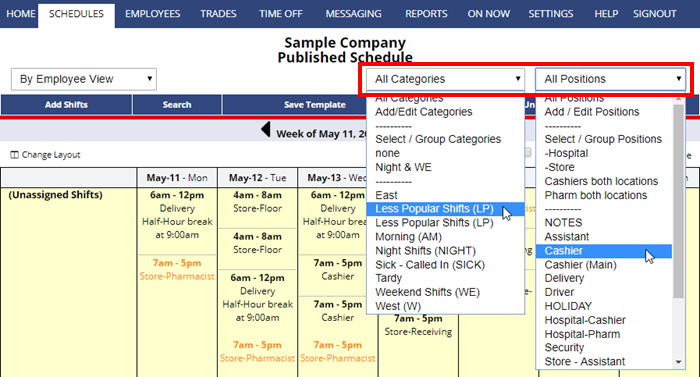 Categories – use of categories is optional – if you have created Categories and set shifts to be in those categories, you can choose any one or group of categories to be displayed. If you choose a Category and then a Position, the view will be limited to only those shifts in both that Category and that Position. Positions – choose which Position you want to be displayed on the screen or Select/Group Positions to show groups of Positions. Note that the By Employee view is unique – as it will show all shifts for those employees who can work that position (including shifts for other positions to aid in the drag/drop of shifts function). You also can use the Search button on any weekly Schedule View – which allows you to set different options and then show a list of shifts that match.